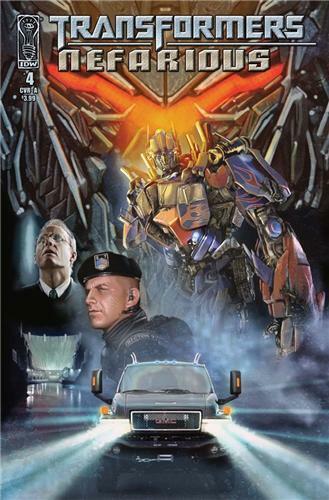 As, once again, we’re reasonably close to publication date, this script (w)rap also serves as pre-release teaser for Transformers: Nefarious #5, the penultimate issue of the official comic book sequel to Transformers: Revenge of the Fallen. Spoilers ahoy, though as always I will try not to give away too much here. So — the pieces are all in place. Soundwave has tried and failed to crack the remarkably resilient nut that is The Initiative (the human organization with some long-standing ties and kind-sized grudges to/against the earliest Transformers to reach Earth — Seekers). So now it’s a joint offensive, Soundwave and the Autobots — together. But first they have to find the Initiative, who — it soon becomes apparent — aren’t just going to sit still and wait for the next attack. And just what did (or who did) happen to Soundwave last issue? What isn’t he telling his newfound Autobot allies? And just who is the Seeker incarcerated within the Initiative’s base? Carter Newell, the embittered and vengeful mastermind behind the Initiative, takes a big step towards the glorious realization of a plan seventy years in the making. Trouble is, in achieving his ends, he may also wipe out the entire world! Story is by me, art by the ever-magnificent Carlos Magno. The issue should be in stores on 14th (US) or 15th (UK) of July. My latest comics review column — Comics Candy — is now live over at totalscifionline.com, with ten choice (and not so choice) pickings from the June shipping titles. So, if you want to know what I thought about the likes of Millar & McNiven’s Nemesis, The Stand: Hardcases, Star Trek: Leonard McCoy, Frontier Doctor, Dust Wars and more, you can find July’s edition of Comics Candy here. And once you’re done, check out the totalscifi home page for more great features and reviews. Just a quick reminder to any Scandinavian Transformers fans (or those from further afield with a yen to travel) that I’ll be doing the guest of honour thing at this year’s Nordcon convention in Aalborg, Denmark this coming weekend (19th & 20th of June). Attractions include a Q&A/signing session, a script to comic page presentation (featuring the art of Nick Roche) and — finally! — the original script for the unpublished issue #4 of War Within 3: Age of Wrath sees the light of day. Attendees will be able to purchase these (signed, of course) exclusively (for the time being at least) at Nordcon. Look forward to seeing you there! For more details, check out the Nordcon site here and the YouTube trailer here. A sort of combined deal this time around, a script (w)rap for Transformers Nefarious #4 and also a pre-release teaser for the same, as it hits stores this coming week (June 16th in the US, 17th in the UK). Last issue saw Soundwave slip through the Autobots’ collective fingers and this issue he’s decided enough is enough. The human organization responsible for both the resurrection/usurping of Ravage and the manipulations that landed Soundwave in trouble in the first place is going down — hard! But the Initiative has tricks up its sleeve that, once again, even Soundwave hasn’t seen coming. And at last we learn some of the how and why about this mysterious and far-reaching organization (which seems to have an uncanny grasp of Cybertronian technology) and its coldly calculating director, Carter Newell. Just how long does his relationship with the robots in disguise go back? What traumatic event eventually gave rise to the Initiative? The answers will surprise you. And, meanwhile, director of national security Theodore Galloway is well and truly in the firing line — hunted by none other than Ransack! Things are looking distinctly terminal in that direction! Nefarious #4 is out in the next few days, with story by me art by the incredible Carlos Magno. Don’t miss it! My latest Comics Candy round up of comic reviews (for titles shipping in May) is up over at Totalscifionline.com, so if you want to see my frank opinions (good and bad) on the likes of Batman: The Return of Bruce Wayne, Frenemy of the State, Thanos Imperative, Choker and more, you know where to go. And if you don’t, here’s a handy link. I’m off to Aalborg in Denmark in a couple of weeks for Nordcon, a convention organized by the Nordic Transfans Association. The two-day event is being staged over the weekend of June 19th & 20th and I’ll be there for both days, meeting and greeting. 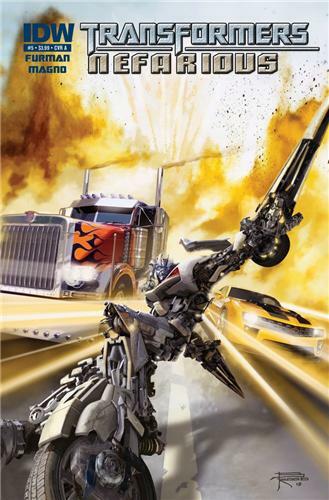 The Saturday will see a Q&A panel and on the Sunday I’ll be doing a Transformers script to page presentation that I put together with artist Nick Roche a while back. I’ll also be bringing with me copies of the script for War Within: Age of Wrath #4 (unpublished!) for signing and sale. Whoo-hoo! So, should you happen to be in that part of the world, do come and say hi. For more details on Nordcon visit their website here. You are currently browsing the simon furman blog archives for June, 2010.